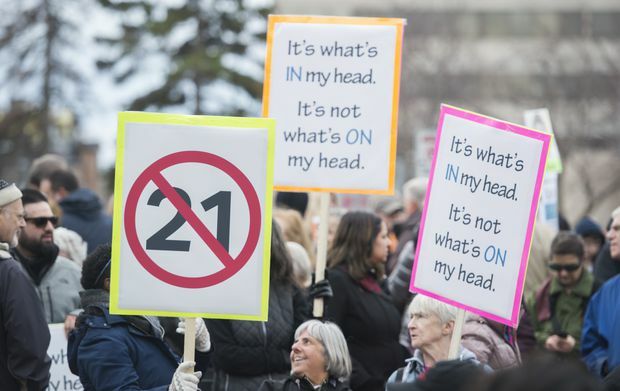 People hold up signs during a demonstration opposing the Quebec government's newly tabled Bill 21 in Montreal, Que., on Sunday, April 14, 2019. A coalition of federal, provincial and municipal politicians added their voices to those opposing Quebec’s proposed secularism bill on Sunday as they joined community leaders and citizens in denouncing the legislation as discriminatory and unconstitutional. He said that while he doesn’t believe the clause should be used at all, it’s especially inappropriate to use it pre-emptively. The protest in Cote-Saint-Luc was only the first of two that was scheduled to take place in Montreal on Sunday. A second event, this one a march through the streets of downtown, got under way shortly after 2 p.m.